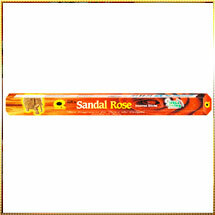 This Sandal Rose Incense Sticks or Sandalwood Rose Incense Sticks will make you fall in love with flowers. These incense sticks are made by mixing pure sandalwood oil and rose flower to give amazingly pleasant fragrance. Our sandalwood rose incense sticks gradually burns immersing the soft and mild aroma of the flowers that will bring out your passion with which you can feel the love and happiness seeping in. The Sandal Rose Incense Sticks release sweet romantic fragrance of rose and heavenly smell of sandalwood will create the alluring environs of garden from which you can never get off. The Twin Series collection of these incense has a dual fragrance of sandalwood and rose in it. A combo concept, which is magically mixed to give a double enjoyment to you. With body, the soul itself gets re-energized by the enchanting fragrance. Our sandalwood rose incense sticks are available at very attractive prices.